Today morning drive to Pushkar. Also known as “the Rose Garden of Rajasthan” and the species of Roses found here are renowned for its perfume and exported world over. 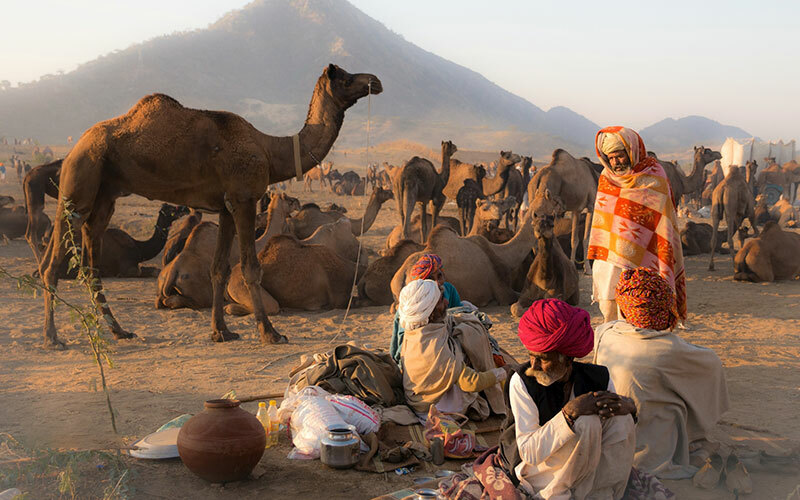 Pushkar festival is famous for animal trade, basically it is a camel fair where traders bring their animals for sale. Animals are put on show and their skills are displayed before they are sold. Overnight stay at hotel. "You guys were just a call away. I felt like home here and never thought India is such a nice place! Can’t get over it and yes, you all are very good people! Had a good time with each one of you!" "A wide range of packages, a high amount of knowledge, so many itineraries- Max Holidays has everything! I loved the street food and especially the shopping part in Pushkar. Thanks for such a great time." "The travel experts of Max Holidays are way too intelligent and as I noticed the knowledge of these people is not just limited to a single place but instead, they know each and every bit of every region." "I had a rich and unique experience here. My children enjoyed each and every bit here and also, they never wanted to go back! But I have promised them to visit this place yet again! I am really grateful to Max for such an enjoyment." 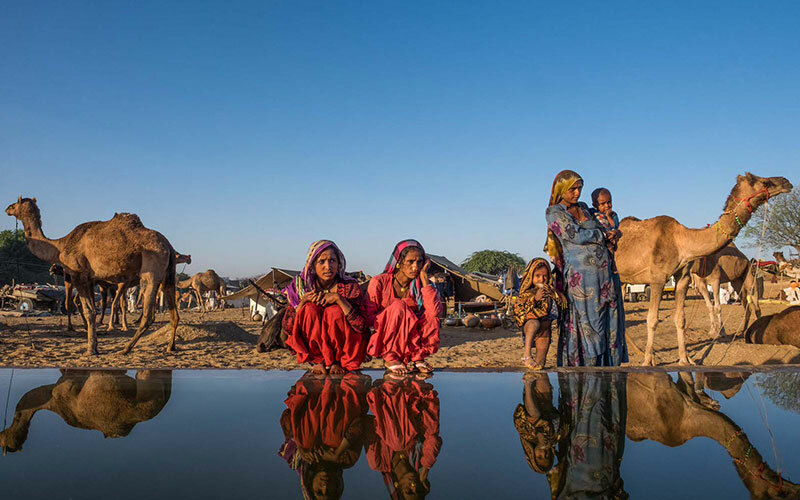 "Pushkar Fair let me see the camels. Ha-ha! Yes, I truly love animals but never saw a camel before. Oh my god……. I loved this place since it was really my kind. Pushkar Camel fair has proved to be an innovative place in my case." 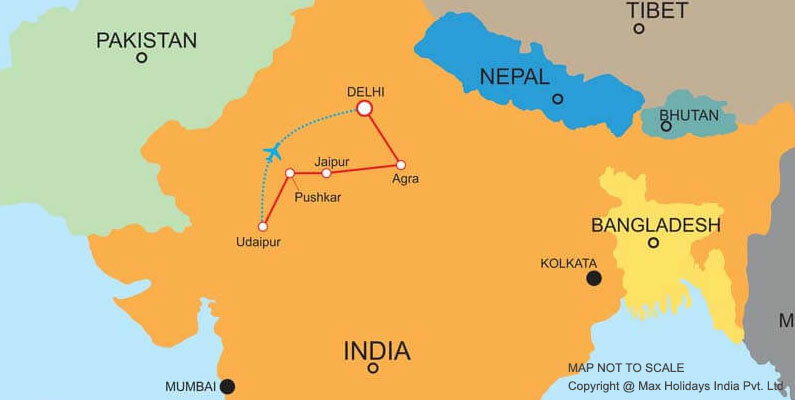 "Had a look at the itineraries of Max Holidays and I liked the Pushkar part. But, since I loved every itinerary but had no money to spend on each of them obviously. I wanted it to be crafted as per my requirements and thankfully Max successfully did it. You are superheroes! " "Max Holidays has really impressed me with the high travel knowledge of its tour representatives as well as the ever smiling nature of its staff. I loved your company guys! Thank You for being such a lovely support. " "I always wanted to have some glimpses of India and that too not through Internet or television but by visiting their personally. Never thought it to be so great! Max Holidays has helped me a lot in bringing out the best from the tour of Pushkar Festival. " "Nothing left me dissatisfied here. You guys are such a great team and I liked the way you all cooperated with me in each and every bit of this tour. Also, Pushkar is a nice place! Thank You Max for letting me know the beauty of this place." "I can’t believe it. Yes, seriously I can’t believe that such a vibrant place even existed. India is very beautiful. I loved communicating with the locales in Pushkar and apart from this, the most important thing- the handicrafts here are amazing and literally I loved shopping!" I travelled to Pushkar in the year 2017 during the Pushkar Fair which is held once in a year. In 2017 it started in the end of October. I and my husband arrived in Delhi then we had visited many places, Agra, Jaipur, Pushkar, Udaipur & Deogarh. 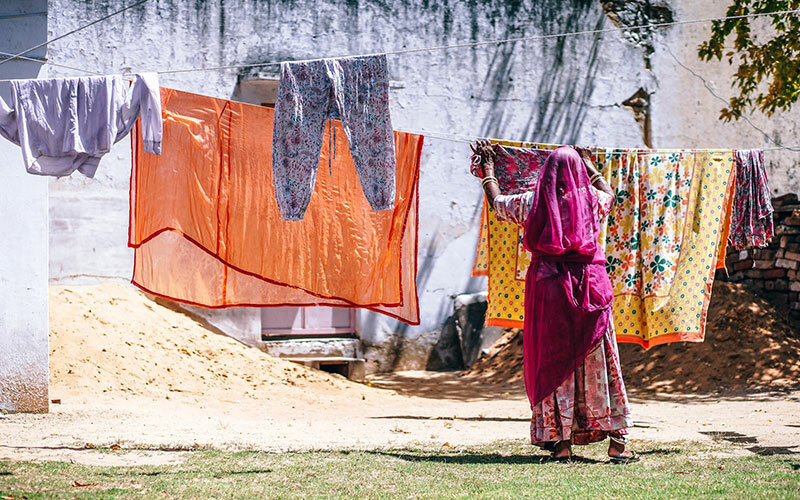 I heard about Pushkar Fair from one of my friend and found it quiet interesting, so I thought taking a trip to this place with my husband. While searching I came across the website of Max Holidays and found their itinerary interesting, so decided to ask them to make arrangements. The staff re-organised the whole itinerary according to our preference, I would highly recommend this company to my friends and family. The guide was really helpful; he helped us throughout the trip. The hotels were amazing, most important the tents in Pushkar during the Pushkar Fair were an amazing experience. "Just in love with Max Holidays that has helped me a lot throughout the trip. Each and every person in its staff has truly proved to be a great aid for me. Their generous nature, fine way of communicating and also a great knowledge of travelling have made me really happy." "Whether it is Ajmer, Taj Mahal or the Ranthambore National Park- nothing failed to impress me in each and every regard. The Pushkar fair is too intriguing and yes, I am surely going to come again here next year and that’s my promise!" "Just can’t let the memories I got from Pushkar get out of my mind in any way! It was my birthday and my mother gifted me with such a great trip to Pushkar. Thank You for making my birthday worthy of such a great memory. I love you Max Holidays! " "Pushkar is a very beautiful place. The colourful aura of this place has left me completely awestruck. I was here along with my husband and not only I but he too is in a surprise when he came across the highly welcoming locales here." "I am completely in love with India and I am really sure about it. This is my third visit to India but a fun-filled experience of the Pushkar fair has now proved to be a true and delightful memory for me. Thank You Max Holidays for such a great vacation! " "I like to start with thanking note to the entire team of Max Holidays for organizing such a fantastic and well organized trip to India for me and my husband. It was our first trip to Asian countries. In the beginning we were little nervous to be frank but the reason for choosing India is because of my friend Anna who shared wonderful stories of India, its people as last year she traveled to India. I was so fascinated and moved by the way she narrated her story and experience. It was an inner call that I should visit this beautiful and incredible country. 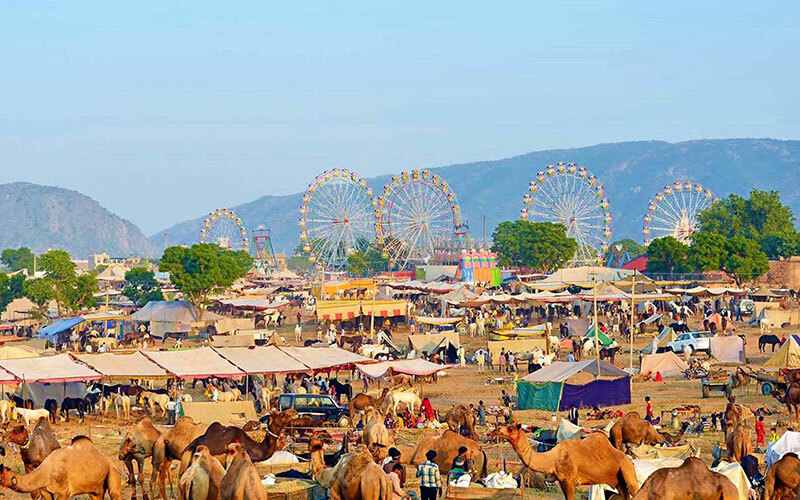 Anna insisted me not to miss Pushkar fair and also referred me Max Holidays who give personalized and tailor made package and that is what I was looking for. I came in contact with Ms. Vidushi who listened to every tinny details of our requirement and put together an amazing tour plan for us. It was very impressive tour plan and we could not ask for more. When we arrived in India, we were greeted in Indian style with garland and Tikka and after that, it was like living a long awaited dream. Everything was exceptionally well like the hotels chosen for our stay, our driver Mr. Kailash who was not just good but was great, guide in every location was good except the guide in Bundi who did his job but was not so good in English but yes a place like Bundi which is not so popular so it was acceptable. Main highlight of the trip was Pushkar fair which is considered as the world’s largest cattle fair. We participated in many activities like playing cricket, dancing with local folk dance group and many more.. An outstanding way to get closer to Indian culture. Thanks once again Max and Ms. Vidushi for putting up such a wonderful trip for us and we will sure that we will return back next year and this time for Kerala as I am reading a programme on your brochure about Kerala. Stay in touch and keep up the good work. "